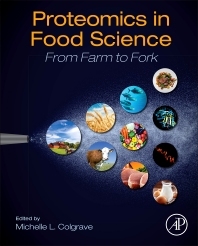 Proteomics in Food Science: From Farm to Fork is a solid reference providing concepts and practical applications of proteomics for those in various disciplines of food science. The book covers a range of methods for elucidating the identity or composition of specific proteins in foods or cells related to food science, from spoilage organisms, to edible components. A variety of analytical platforms are described, ranging from the usage of simple electrophoresis, to more sophisticated mass spectrometry and bio-informatic platforms. The book is designed for food scientists, technologists, food industry workers, microbiologists, and public health workers, and can also be a valuable reference book for students. Chapter 27. Proteomics Analyses Applied to the Human Foodborne Bacterial Pathogen Campylobacter spp. Dr. Michelle L. Colgrave is the Molecular Analysis Team Leader in the CSIRO Agriculture Flagship, based at the Queensland Bioscience Precinct in Brisbane, Australia. She is using mass spectrometry (MS) and proteomics to help identify key proteins that will benefit Australia's livestock and plant industries and improve human health. Dr. Colgrave is working to identify novel proteins and characterise their function and post-translational modifications.